The SLR-like Casio EXILIM Pro EX-F1 has a high-speed six megapixel CMOS image sensor, and is capable of shooting at full resolution for up to 60 frames, at a truly staggering 60 frames per second. 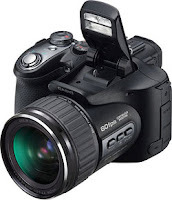 Cleverly, Casio has made it possible to adjust the burst-mode rate between 1 and 60 frames per second, trading off shooting speed for burst length up to the 60 frame burst limit. The Casio F1's speed isn't just in still-image mode - you can also capture 60 fields-per-second movies at 1920 x 1080 pixel resolution, and there are several lower-resolution movie modes that bring unheard of framerates. At 512 × 384 pixels the Pro EX-F1 can capture 300 frames per second, and this doubles to 600 fps at 432 × 192 pixels. At the lowest 336 × 96 pixel resolution, this doubles once more to a truly jaw-dropping 1200 frames per second.